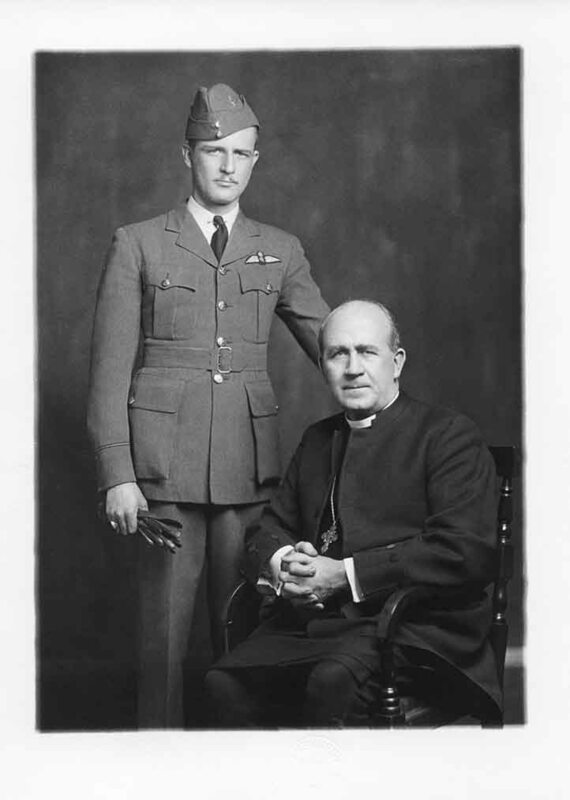 Before World War II, The Rev.Robert John Renison was appointed as Chaplain of the Royal Canadian Air Force in which capacity he was often called upon to perform duties for the Air Force in full uniform, despite being too old for active combat. Bishop Renison’s older son, Robert J. B., was a fighter pilot in the 405th Squadron of the Royal Air Force. His younger son, George, enlisted in the 48th Highlanders Regiment, serving in the United Kingdom, Germany, and Italy, where he was injured by a landmine. In May of 1940, Bob and his wing commander were shot down. In September 1940, his family finally received news that Bob was wounded and was a prisoner of war in Germany. He was held at Stalag Lufte III. In October 1944, the Red Cross lost track of the prisoners of Stalag Lufte III. Around early 1945, Bob hitched a lift to London, arriving sometime after Victory in Europe (V.E.) Day (May 8th). His brother, George, received word that Bob’s camp had been overrun, and gained leave to go look for his brother in London. They met in a pub, where evidently they thought that a celebration was in order. They then sent a cable to their parents that Bob was safe. In 1941, the Rt. Rev. Robert.J. Renison (who for over 20 years wrote a column for the Globe and Mail) was selected with eleven other journalists from Canada, to visit England as guests of the British Council. They left between September 16th and 18th from New York to England by “Pan American Clipper” and stayed for 3 weeks. This is a black and white photograph of The Rt. Rev. Robert J. Renison with his first son, Robert J. B. after he enlisted in the Royal Air Force. Robert J. B. was a fighter pilot in the 405th Squadron of the Royal Air Force. He became a prisoner of war in 1940 and was released in 1945. Before World War II, The Rev. Robert J. Renison was appointed as Chaplain of the Royal Canadian Air Force in which capacity he was often called upon to perform duties for the Air Force in full uniform, despite being too old for active combat. 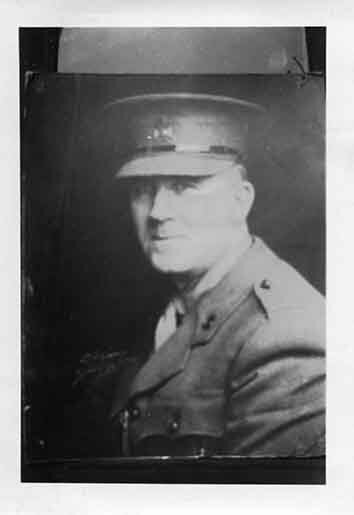 This is a black and white photograph of Bishop Renison wearing his Air Force uniform. 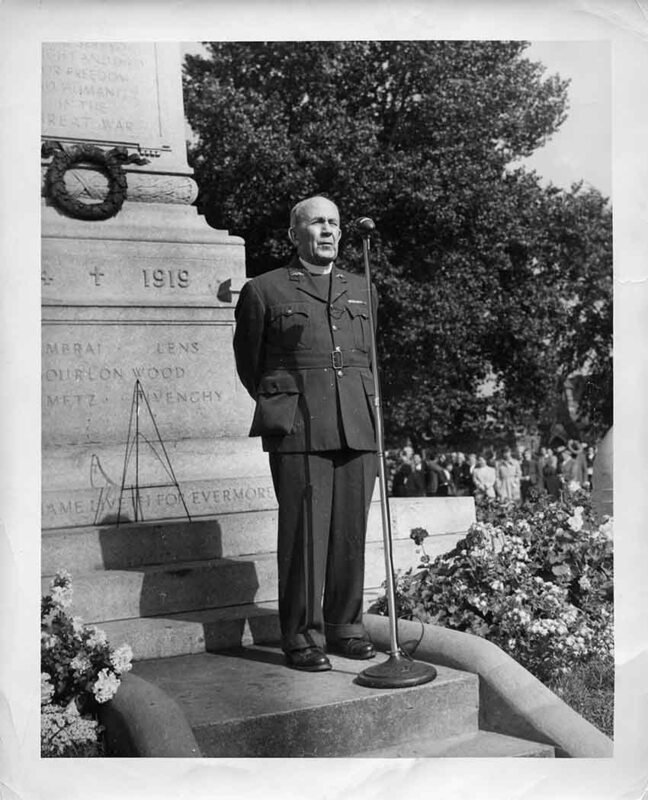 A photograph of Bishop Renison leading a ceremony in front of the North Bay cenotaph (celebrating the end of the war?) He is wearing a Royal Canadian Air Force Uniform. He is likely in North Bay due to his duties as Chaplain of the Royal Canadian Air Force. In 1941, The Rev. Robert J. Renison (who for over 20 years wrote a column for the Globe and Mail) was selected with eleven other journalists from Canada, to visit England as guests of the British Council. 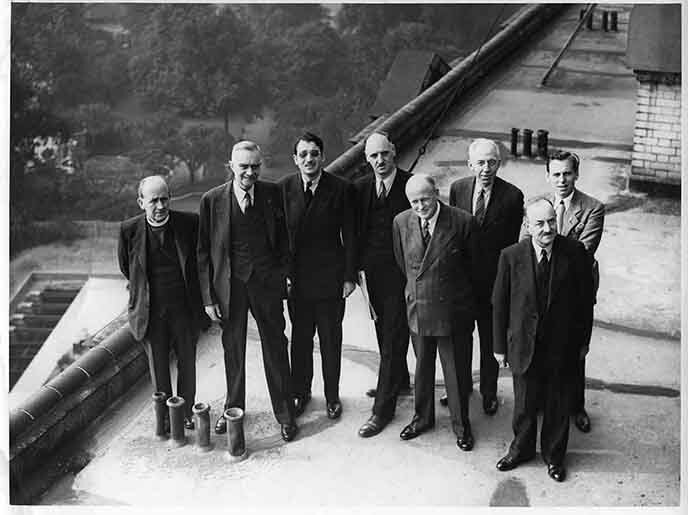 Here they are photographed on the roof of their hotel on Sept. 30th, 1941. Booklet of Sermons "Does God Care?" Booklet of Sermons "Does God Care?" given to the parishioner's at St. Paul's Church, "Dedicated to the Men and Women of St. Paul's Church, Toronto, on Active Service.” Rev. 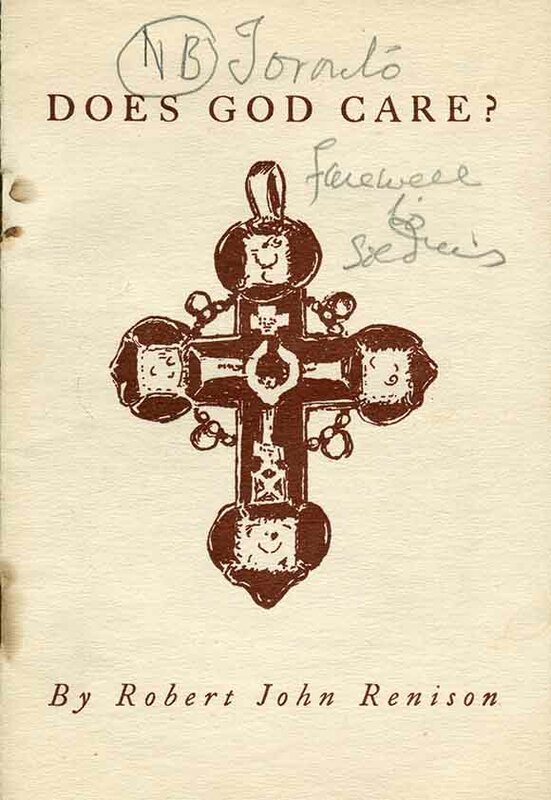 Robert J. Renison produced this booklet just before he left for Moosonee, (he left Toronto on January 1, 1944), and sent it to the men and women of the church on active service. He wrote also that he would read the 400 names on the St. Paul’s Church “Roll of Honour” on New Year’s Eve and remember them in prayer. The Roll of Honour was a list of active service men and women in the Second World War. Rev. Robert John Renison with his first son, Robert J. B. Cover of a Booklet of Sermons "Does God Care?"